Most standard hotel rooms sleep a family of four. So what do you do if your family has more members? 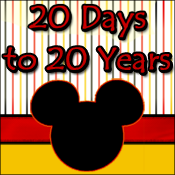 Todays tip addresses the options larger families have when it comes to spending the night in Disney World. Most deluxe resorts can accommodate a family of five comfortably (with the exception of standard rooms at Animal Kingdom and Wilderness Lodges). Several resorts offer deluxe rooms (suites, Jr, suites) which may have as much space or more as 2 queen beds plus a sleeper sofa- inquire with your travel agent or specify suites when you are booking online. If deluxe is not in your budget, then your remaining standard hotel option is Port Orleans Riverside. The rooms in the Alligator Bayou section have a small trundle bed to accommodate a petite person. Suites are also available in the moderate resort Coronado Springs; but for a "suite" price! Another alternative is the campground. Of course, if you have a camper or a tent, then you can fill your own equipment with as many people as you need. Don’t have your own camping equipment? Disney will rent you a large tent and even cots. If a tent isn't your style, there are RV rental places in the greater Orlando area. For example Make Camping Easy will set up an air conditioned camper right in your site! You can also find cabins in Fort Wilderness campground. These come complete with a double bed, a set of bunk beds and a double size Murphy bed, all together sleeping six comfortably. These cabins also have a full kitchen. 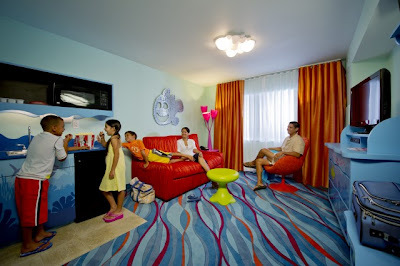 The last option is a Family Suite at the value resort All Star Music or, as of May 31, 2012 The Art of Animation Resort! The cost is higher than in a standard room in a value resort; however, there are sleeping options everywhere you look, two bathrooms and a kitchenette. These sleep six. Do you have a really big family? Of course, you can always get two adjoining rooms in any resort, but there are other possibilities as well. Disney’s Vacation Club offers suites from one room to three bedrooms. All have kitchens. Rooms can be obtained through Disney reservations, or you can rent vacation club points the owners are not planning to use by contacting a go between such as DVC-Rental.com .